9905 Club Springs Way, Louisville, KY 40291 in the Springs of Glenmary is where you'll find The Hollinden Team newest listing. This is a view of the first floor unit. The concrete patio is slightly elevated which gives you a view of the swimming pool. This home is not currently on the market, contact the Hollinden Team about this home’s history and other houses in the area. 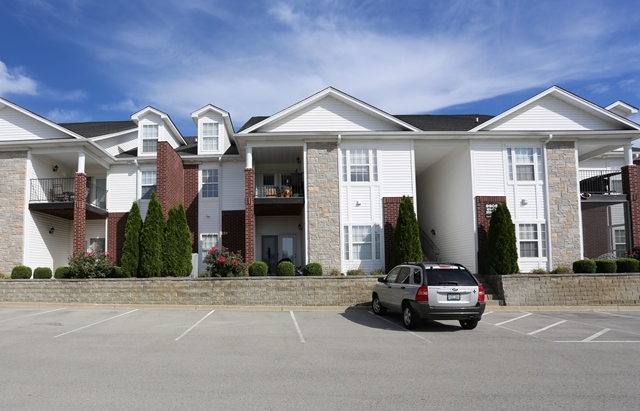 This "like new" ground floor open floor plan condo offers 2 bedrooms and 2 full baths. The current owner has taken immaculate care of this home. You could seriously call him Mr Clean. This place is just like a new construction model. The oven, dishwasher and hall bath shower and tub have never been used. Well, maybe one Hollywood Icon has used it. You'll have to check out the additional photos to see which celebrity has graced this home with her presence. If you are looking for new construction, but can't wait for it to be completed, then this is the condo for you. There are neutral paint colors and flooring throughout. The Monthly Maintenance fee here can not be beat at $112.40, for these amenities are exceptional. The development has a wonderful pool and clubhouse. There is also a Fitness Center open 7 days a week from 6AM to Midnight. Plus it's right across the parking lot for your convenience. Your maintenance fee also covers water, trash, snow removal, exterior maintenance, groundskeeping and master insurance. I've seen other developments not nearly as nice with much higher maintenance fees. The Springs of Glenmary is FHA Approved. That is becoming harder and harder to find these days. Being FHA approved will allow someone to get a loan with only 3.5% down. Call Tim Hollinden at 502-429-3866 for a private tour of this like-new condo in the Glenmary area. There are also many other condos and patio homes in Glenmary that are for sale. They range from conventional condos to patio homes with 4 bedrooms on the Glenmary Golf Course. The Springs of Glenmary is FHA Approved. Come check out this SUPER clean like new condo today.